Your sweetheart will fall head over heels in love with this adorable Love Teddy Bear. Make any romantic occasion more loving for your husband, wife, boyfriend or girlfriend by presenting this classic Romantic Plush Bear. Our premium, super-soft Gund Teddy Bear has amazingly silky fur. With a broad smile and big nose, this two tone bear is a big winner with anyone who holds it! This Teddy Bear measures about 18" and includes free personalization! 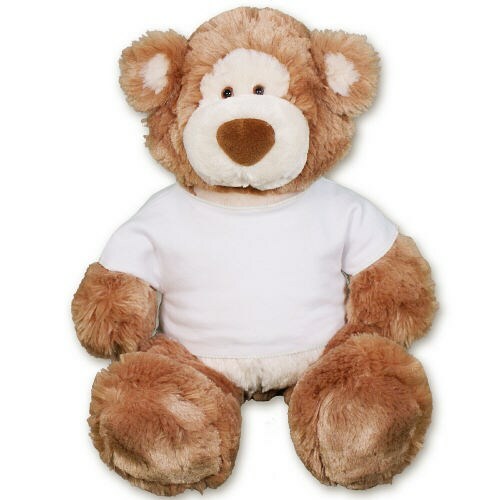 We will personalize your "Cupid" Teddy Bear T-Shirt with any two line custom message. Or, you may choose a different design on this bear that fits your needs. Free Gift Wrapping and a Free Gift Card is included to create a thoughtful presentation. Alfie is a premium super-soft Gund Bear with an amazingly silky touch that feels like "sheared rabbit" fur. With a broad smile and big nose, this two tone bear is a big winner with everyone who holds it! Alfie measures about 18 inches of cuddly loving bear. Free Gift Wrapping and a Free Gift Card are included to create a thoughtful presentation.